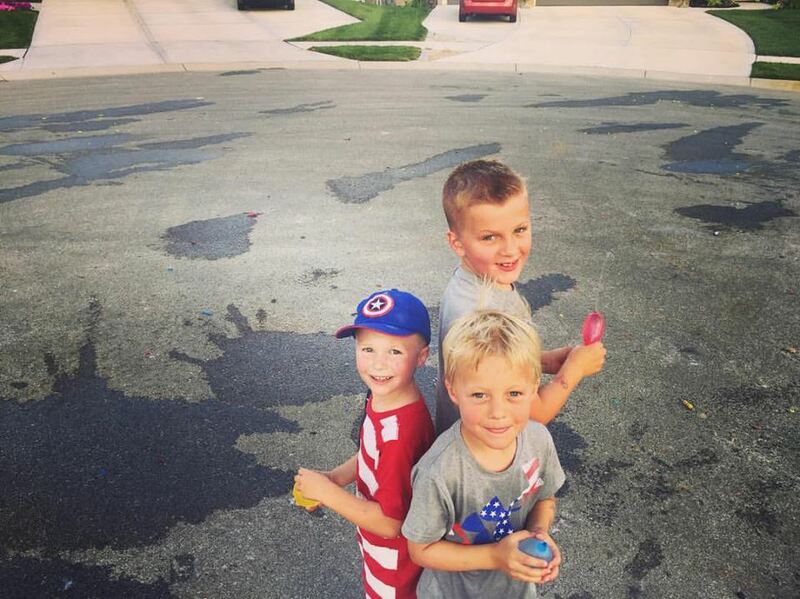 This may have been my favorite 4th of July holiday in recent years, mostly because the celebrations just kept going. We kicked off the weekend with our neighborhood celebration & it just rolled from there. Late Monday afternoon we headed to the Walshes. We've been going to the Walshes for years now since they live in Lees Summit and fireworks are legal there---in Lenexa, we can't shoot them off. 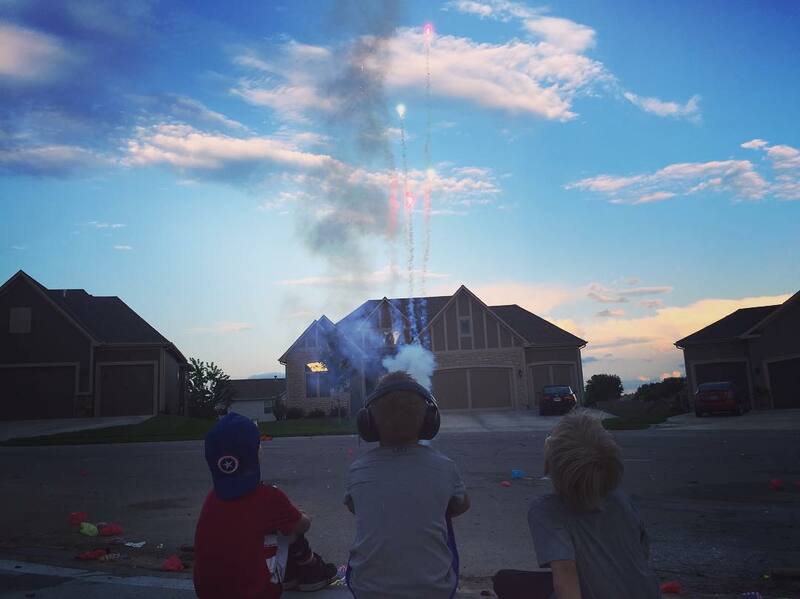 I get it I do but having a childhood without fireworks is just wrong. Plain. Wrong. 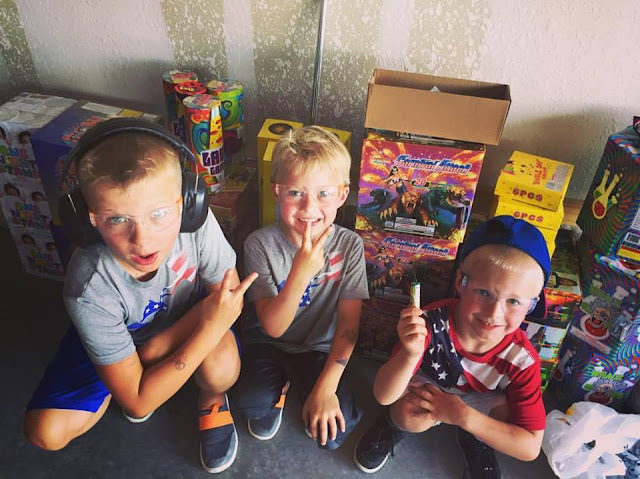 It doesn't hurt that the 4th of July happens to be one of Jake and Jennifer's favorite holidays & they don't skimp when it comes to fireworks both big or small. The boys were another year older and a little more brave this year. 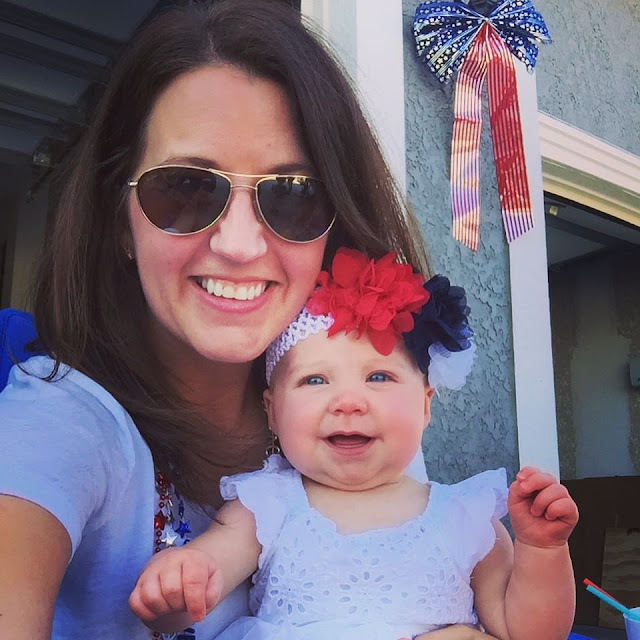 Kaden actually tends to be our hesitant child and there were times where that certainly showed but for the most part it was one firework after another...while I sat back and held Miss Kendall. They ran down parachute after parachute. They lit off fountain after fountain, threw snappers after snappers. And after all that they had a water balloon fight. We ended the night on the Walshes back deck watching Jake's finale---it was worth the wait. His wife even FBLived it so friends & family who weren't able to make it could watch along. Each year he keeps upping the bar so I can't wait to see what he does next year---maybe he will add music to it! The kids were beat & didn't wake until almost 9 the next morning---too many nights in a row being up way too late but man, they were having sooo much fun. First on the agenda, we needed to whip some cupcakes together for America's birthday---it's our tradition. 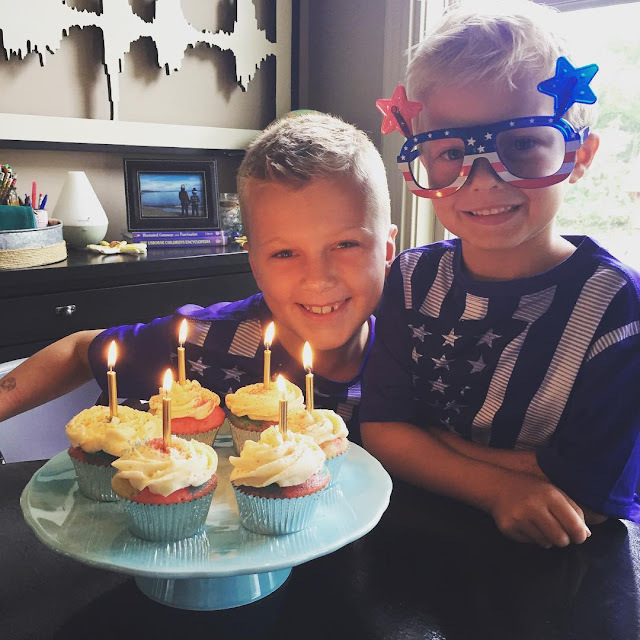 We pick out a fun USA cupcake recipe & we go to work in the kitchen. Each year they get better and better at helping. We had the cupcakes baked but the icing would have to wait as we were headed to lunch with the fam bam. 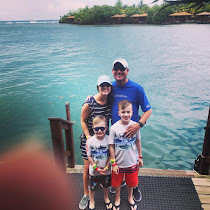 Last year we came home from Cabo on the 3rd to no power so on the 4th we had lunch at BRGR with the fam, this year we continued the lunch tradition and met at Johnny's. As the boys walked in Grammy handed them their 4th of July shirts & off to the bathroom they headed to put them on. 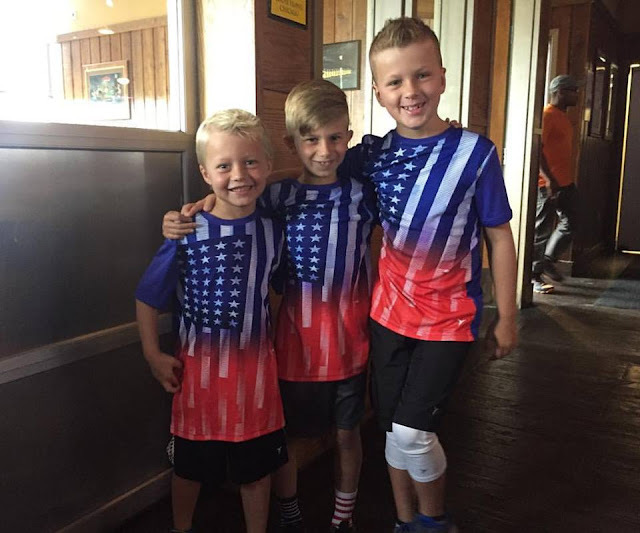 Grammy gets them a shirt each year to celebrate the 4th of July and in the past they have been the Old Navy flag shirts, this year she had to go a different route and the boys were all about it. 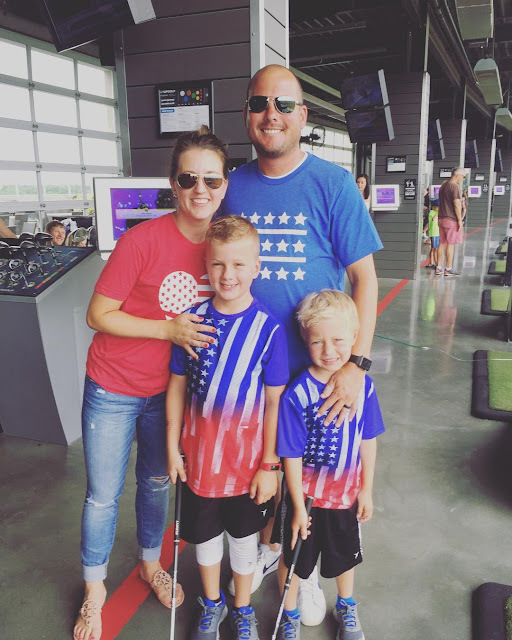 We had hoped to spend the day at the pool but the weather had something else in mind so we headed to Top Golf where Justin and I enjoyed an afternoon beverage & the boys worked on their form. 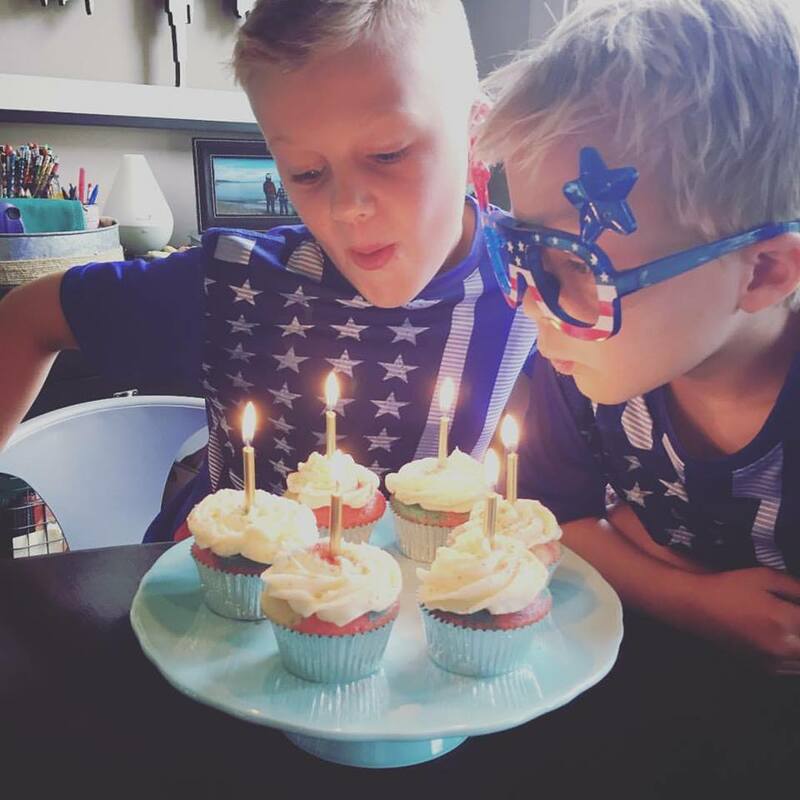 & then it was time to sing happy birthday to America and make a wish for her---may this year bring a little more love, peace and understanding for her. We finished the evening off with a wonderful dinner with some very sweet and dear neighbors which included a melting pot of food, just like America & then a quiet walk home followed by the Macy's Firework Extravaganza. It was a great four days.